I put all the boards and circuits together this weekend and made a couple of test welds. The capacitor I used is the biggest of 7 capacitors and the capacitance is 35 % lower than it should be. 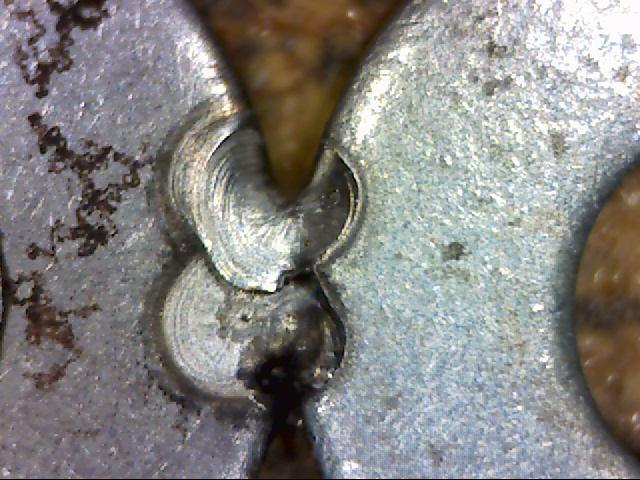 I welded a couple of small washers together and there were problems from the start. At first I could not get a plasma flame going and after adjusting the argon gas pressure lower I started seeing results. 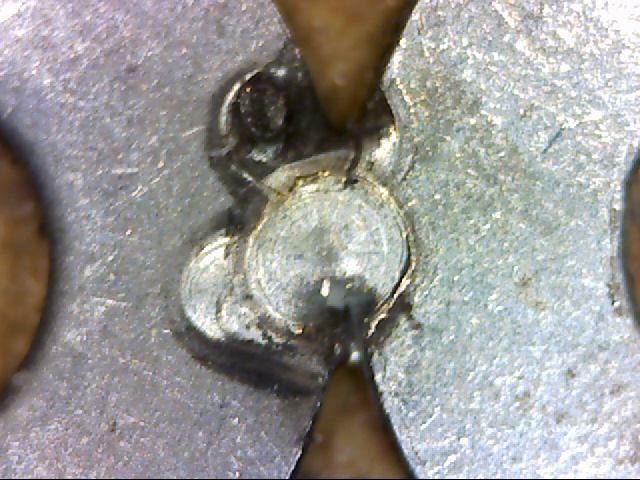 Another problem was that the capacitor was not discharging completely and it means that the plasma flame was dieing half way through the weld. The total energy roughly worked out was about 50Ws and with only half the capacitor discharging was more in the 25Ws range. This welder is going to be 250Ws and after I get all the little growing pains shorted out, It just might live up to its full potential. It doesn't look like much but it is a start. The welder needed to be tweaked and after receiving some parts from Digikey today I managed to adjust the precise pulse timing for this welder.I welded two screws together with the weld energy set to 50Ws. The welds are very shiny, clean and strong. What next are You planing? I hope my small donation is welcome. Yes your donation is very welcome Thank You and thank you to everyone that gave me donations!!! Movies suggest that You're doing great. Peter I am experimenting with the start circuit. I'm looking into adding a high voltage plasma start to the circuit. I do not like working with High voltages and are very afraid that I might kill myself :)) I am going to switch the High voltage circuit at 25khz at a current below 1ma which should make it skin effect safe. Anyone with some knowledge that can help will be greatly appreciated. Have you got scheme for stylus? Hi Fritz,if you want to use ABI welder concept(high voltage arc/the electrode not in contact with the welding object) you lose control.The arc will go to the closest to the electrode spot.Imagine that you want to weld in the bottom of narrow channel.The arc will go to the side of the channel.This is working for big TIG welders,but not for micro welding where you need much more accuracy. I can't wait to build your pulse arc welder. Chris, yes it makes sense. My plan is to make the High voltage selectable. Three modes 1:lift start 2:lift start with high voltage assist 3: Just high voltage start. Rik, I have a drawing but the stylus is just a prototype and I am going to make some changes to it. I want to make the distance that the electrode move better adjustable and the front end thinner to save argon. I will make the drawing available when I done. hello to all,this is such a wonderful project.Does anybody tried to do the same? Search for a DIY Spot Welder in Youtube - Plenty of Microwave transformer spot welders there. Love this concept! As a hobbyist and a Ham radio operator (KC9UVB) I can see huge potentials for this if it is affordable even in kit form. Will this welder be too robust for building battery packs?